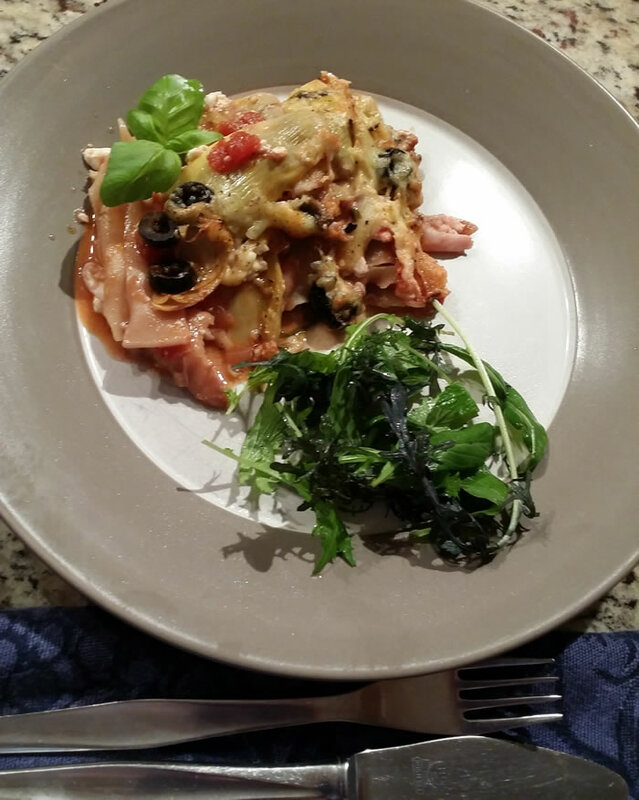 The combination of smoked chicken and chargrilled artichokes works really well in this, simple to make, lasagne. 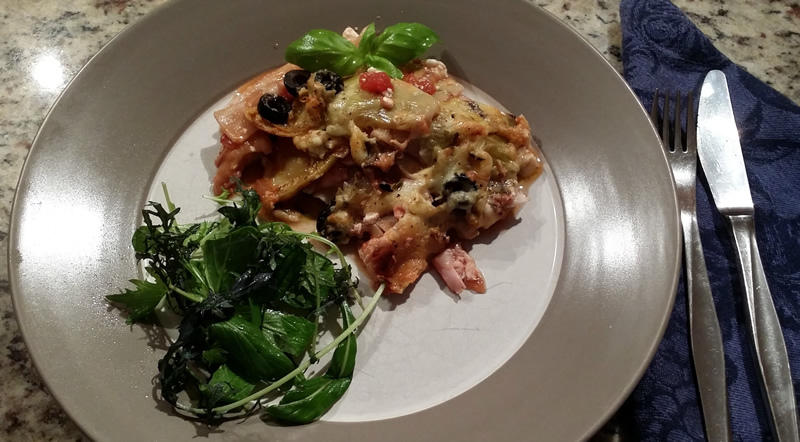 I used Delmaine chargrilled artichokes to add a subtle “barbecue” flavour which really enhances the smoked chicken. Only use the chicken flesh, not the skin. 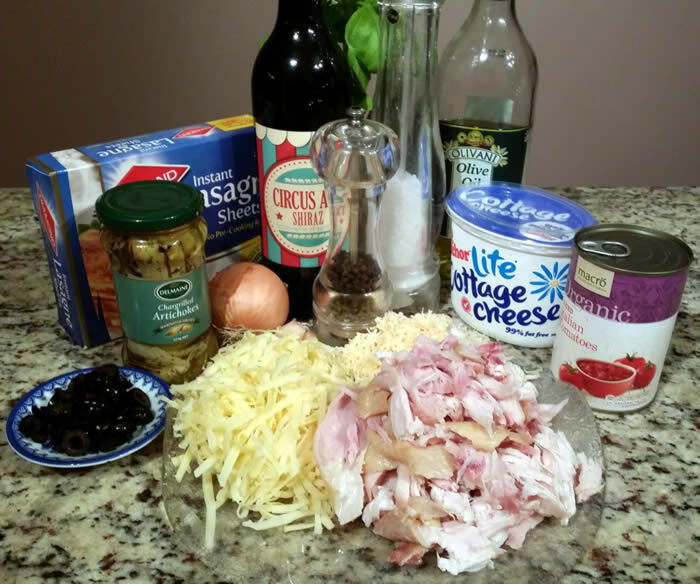 Cottage cheese could be replaced with ricotta if you prefer – I find the taste very similar, real difference is that ricotta is a lot more expensive but does end up smoother than cottage cheese. 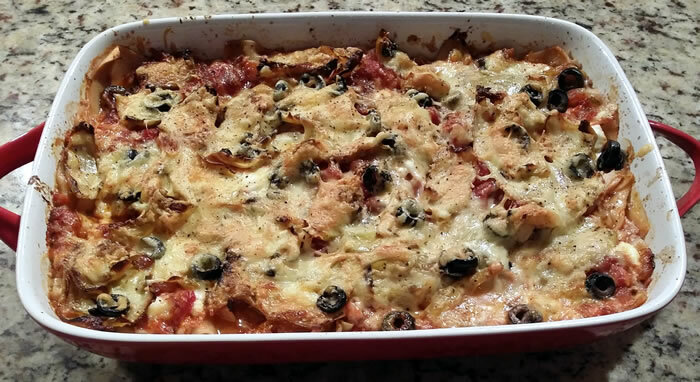 I’ve used dry lasagne sheets which don’t require pre-cooking, but you could substitute this for fresh lasagne. 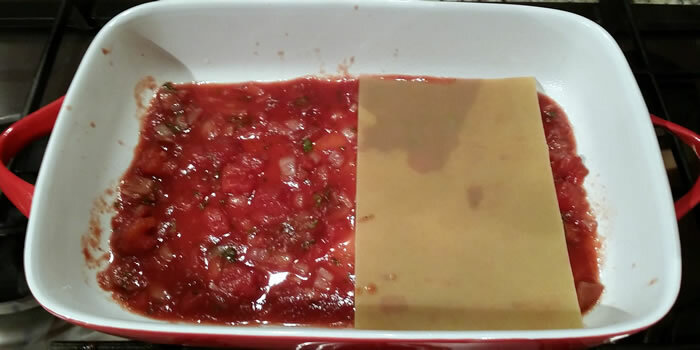 The quantity of lasagne required will vary – you just need enough to cover two layers (this was 5 sheets of the brand I used). Edam is my preferred cheese as it has around 25% less fat than most of the other “everyday” cheeses and the parmesan adds plenty of authentic “cheesy” flavour. 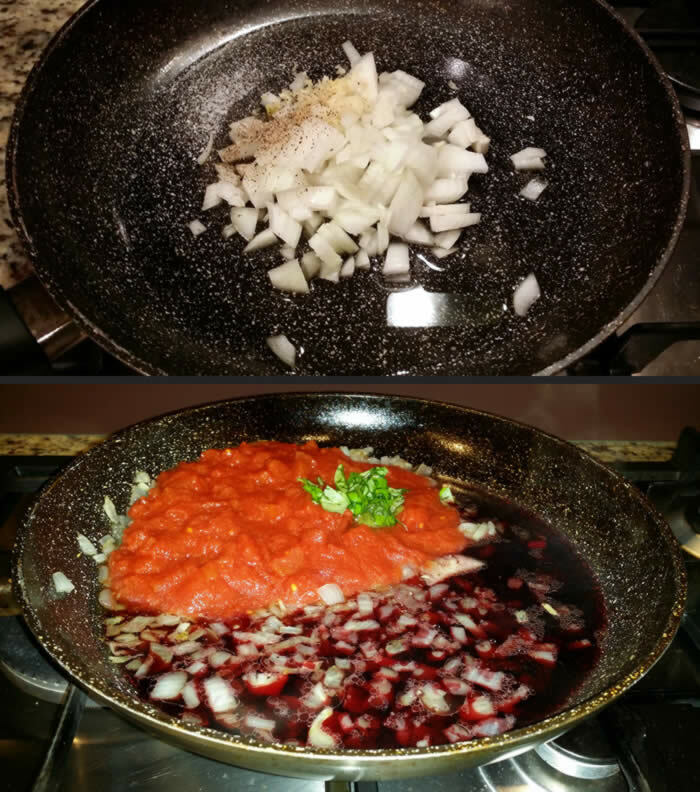 Heat the oil and add onions and garlic, season and simmer gently until opaque. Add red wine, tomatoes and basil and continue to simmer until reduced to a chunky sauce. 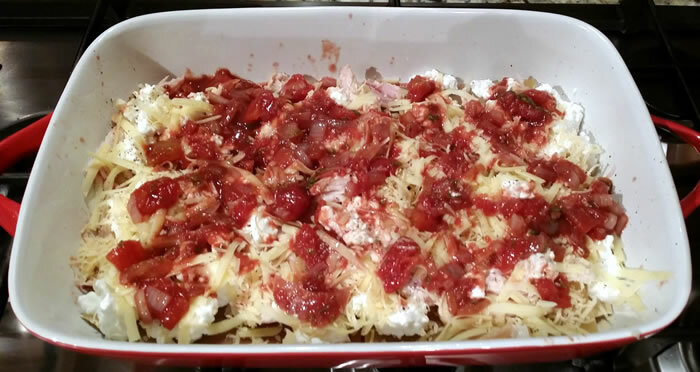 Grease a large oblong casserole and spread ⅓ of the tomato sauce over the bottom then top with sheets of lasagne to cover. 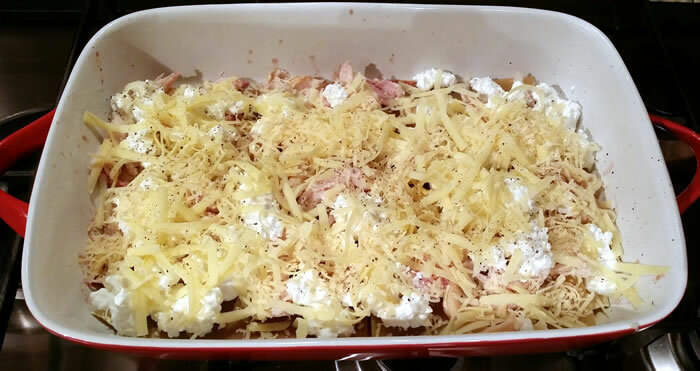 Top with ½ of the chicken, cottage cheese, edam and parmesan and season to taste. Top with another ⅓ of the tomato sauce. 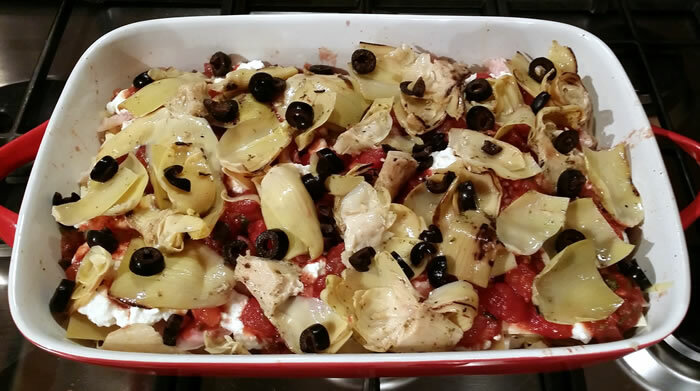 Cover with another layer of lasagne, then remaining chicken, cottage cheese and then all of the artichokes and olives. 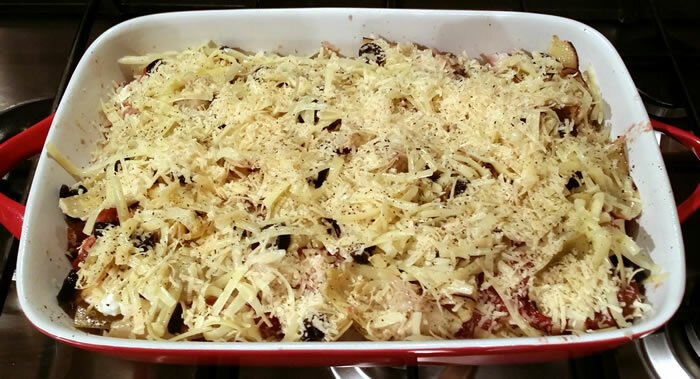 Finally, top with remaining edam and parmesan, then liberally grind with black pepper. Bake at 180°C for 30 minutes. Let stand for a few minutes. Serve with a dressed green salad.